Alexander Street is tiny, nothing more than an alley behind the Holiday Station off 26th Avenue East, parallel to Jefferson Street in Congdon Park. It has now basically become an entrance to the eastern portion of the Lakewalk, swallowed up by London Road development. 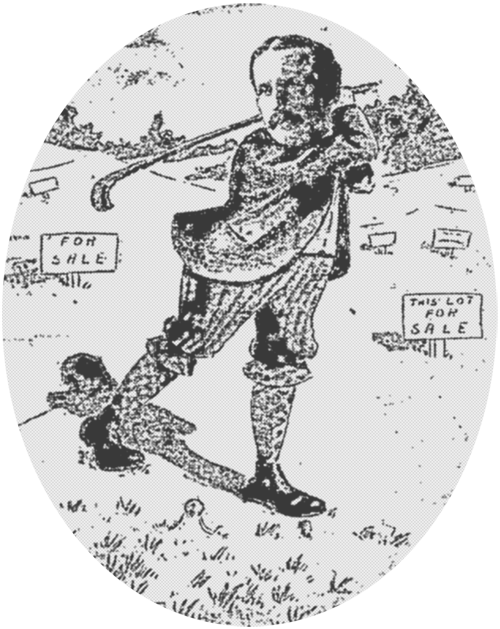 Its namesake, Edward Porter Alexander—known as E. P. Alexander—has likewise been swallowed up by the movement of time marching onward—another Duluth man who came during those peak money-making years to buy and sell land, whose family afterward moved on westward. E. P. Alexander Jr. was born in 1863 in Virginia, the son of a famous Civil War general (also named Edward Porter Alexander), one of the Confederacy’s most important commanders. Alexander was General Robert E. Lee’s top man in artillery and engineering, and also became a well-respected author and mathematician. In 1902, he gave a commencement address at West Point that caused a bit of a kerfuffle in the southlands when he said it was, “best for the South that her cause was lost,” and that he was glad his children grew up in a united country. President Grover Cleveland was a close friend of the family, and often visited the general’s hunting lodge on South Island, South Carolina. (According to E. P. Jr.’s obituary, Cleveland spent his last birthday there.) The old general was also a very wealthy man, with investments in all the usual growth and extractive industries of the late 1800s, including holdings in Central America. The younger Alexander came to Duluth in 1886 at the age of 23, ready to make his own fortune in real estate. He immediately launched his own firm, the Alexander Investment Company, which bought and developed property all over Duluth, including in Fond du Lac, Portland, Rice’s Point, Minnesota Point, and especially Endion. Starting in 1897, he was the agent in charge of the Torrey Building, and was also for a time associated with the Duluth Banking Company with A.W. Speyers. His office was in the Manhattan Building for several years. Alexander’s life was marked with some fairly serious ups and downs. His file at the Northeast Minnesota Historical Center is filled with personal and business letters that reveal the financial issues that plagued him. Some of his deals went bad, and at least one partner skipped town, leaving Alexander holding the bag. In 1909, Alexander almost died in a serious car accident on a golf outing with fellow Duluthians Robert Dowse and R.T. Goodell, when their chauffeur-driven touring car went over a ravine in Rock Creek, Minnesota. (Luckily, all occupants of the car survived.) Golf was an obsession for E. P. and his wife Agnes. They both frequently appeared in local newspapers as trophy-winning golfers, their clubs upraised in photo after photo. He spent winters in Georgia, where he was a member at Augusta National, and regularly won tournaments at Northland Country Club. When Alexander’s father died in 1910 there was an inheritance dispute with the widow. (One of E. P.’s brothers privately characterized the woman—the general’s second wife, who married him less than ten years before his death at 75—as a gold-digger and thief.) A compromise was reached in the interest of keeping a public scandal under wraps, but it was all for naught—within five years the brokerage firm that held the inherited investments went bankrupt and the fortune was lost. Around that time, Alexander bought some property on Clough Island (also known as Whiteside Island) in St. Louis Bay, and built a house there he named Killjoy Lodge, which paradoxically became a joyful social place for the family. Then came World War I. His son—also named Edward Porter Alexander—was a graduate of MIT and recently married. He headed off to war as an engineer at the age of 27, and became Duluth’s first casualty of the war, a victim of the Spanish flu at St. Nazaire. The Duprey-Alexander American Legion Post in the West End bears his name. After this tragedy, many people familiar with Clough Island thought the lodge was named for his sadness over his son’s loss. And the family did soon abandon it, though more likely because his remaining children had grown up, married, and moved west. He often loaned it out to scouting groups and others looking for a place to hold events. In 1939, at the same age his father passed, the retired E. P. Alexander burned to death in his home at 1713 East Superior when his bathrobe was ignited by a gas log in his fireplace. His wife Agnes Gordon Grady Alexander, moved to be with her children, and lived to the age of 90. The Alexander family continued to have an impact on the larger history of the United States. E. P.’s grandson, born in 1926, was Alexander Porter Butterfield. He was a key figure in the Watergate Scandal—the White House aide who revealed that embattled President Nixon had tapes of every conversation that occurred in the Oval Office, breaking the case wide open.